They die, it’s inevitable. One day, they stop performing. The signs can’t be ignored; streaks, leaks and screeches. Their useful life is over; it comes time to have them taken away to wherever dead appliances go. After you lament excitement sets in, the prospect of something new, better, and shiny lifts your spirits! I’m not sure if this is everyone’s experience, but it sure was mine when our family had to say our goodbyes. We saw it coming and nursed that appliance for as long as we could. But when it was time to pull the plug I was ready, armed with my list of criterion to welcome a new dishwasher into our home. Armed with list in hand I did my research and scoured the market for the perfect dishwasher. I found it! I was so proud… But I could not readily admit it. Why? Well… It was the exact model that my wife told me she wanted all along. I can be stubborn at times. There was no way we were buying the dishwasher that she fell in love with on a television commercial. But Kelly Ripa seduced my wife, she too wanted to Be Even More Amazing. I conceded and we bought the Electrolux. Why I am retelling our dishwasher experience? Today a friend (thanks Eric) sent me an article in the Wall Street Journal about the attention marketers are now placing on sound branding. The sounds you identify with a brand and the aural experience when you use a product. As a sound guy I’m elated to see the world waking up to the importance of sound in our lives. When we hear something, we store the sound in our auditory memory. We perceive it as positive or negative, and with rare exception the first impression is the lasting impression. How do you feel about the sound of nails on a chalkboard? The most important criterion I had for the dishwasher was silence. Our family spends the majority of our time together in the kitchen. So, naturally we want to create as serene a sound environment as we can. Who wants to shout over a noisy appliance? 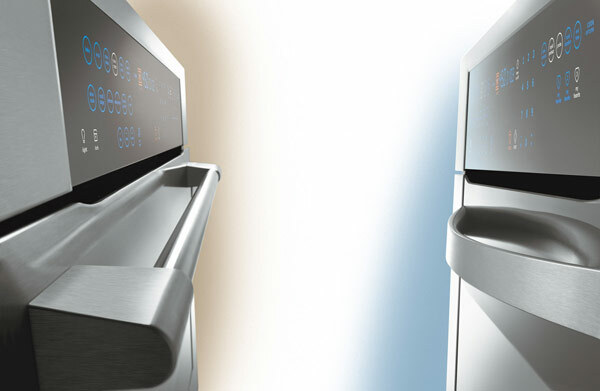 Electrolux scored high with me on two crucial elements of sound branding. Kelly Ripa’s voice is an ear worm in my brain saying “Be Even More Amazing.” The marketers created a sticky tagline that I’ll never forget. The product. It delivered as promised, it is absolutely silent and I’m a happy customer. I’m curious, does sound consciously influence your buying decisions? Please share your comments below! Sound is a major influence in my life. I can no longer dine near clanking silverware, sit near loud latte makers or be at peace near loud sustained noises. ALL THIS SINCE MY BELOVED FORMER BUSINESS PARTNER OPENED MY EARS! You see, Don G Campbell, your co-author and our mutual friend, taught me (and countless others) to truly listen and hear. We would travel together as we served hospitals with our Aesthetic Audio Systems Harmonic Healthcare. He would refer to sounds that, frankly, I did not hear. My senses were numbed, my attention diverted and I must have unconsciously shut off my hearing. Don gave me back my right and pleasure to hear. So now, I too make purchasing decisions with sound and noise in mind. And, in my business of consulting and mentoring, I always advise the same. I remember Don commenting that we can close our eyes and we can close our nose (we diaper changing fathers know how) but we can’t close our ears…..so be careful where you spend your time. Don passed away just a few months ago but I think of him often and every time I consciously avoid loud noises. I no longer eat in restaurants with blaring music, I simply cannot. I walk out of supermarkets with the same kind of music. It is amazing that when I ask another customer in the store if that music annoys them, they usually respond – oh I didn’t even notice it until you pointed it out! How much more are we unconscious of what subliminally affects, or even worse, indoctrinates and harms us? In the short term there is a choice between being an ostrich or becoming aware. Once aware, the choice is simple (actually there isn’t even thought of a choice). Only awareness and the consequent actions (ie telling the manager of the supermarket to turn the sound down or change the channel – which I often do and they comply) or simply not shop there, only awareness will change the world to be a more peaceful place..
Air filters and fans are notorious for making sounds that iterrupt sleep. Check out the sound before you buy one.